« Colombia #3, "Welcome to Colombia, Brother and Sister Uodson!" Colombia #4 "The Army and Police fight tonight." So, after a week or so, we are getting settled into our assignment. The schedule is a bit busier than we are used to but I have to admit we get much more done. Breakfast is at 7 AM and we start work at 8 AM. Breakfast (Desa-uno in Spanish) is with the entire Bethel Family of 350 or so Brothers and Sisters. We all dress nice and listen to a 20 minute spiritual meal to get the day off to the right start. Work for me consists of construction and Tamara has been assigned as a house-keeper. She has half of the fourth floor on the North side. What that means is that she cleans, and I mean CLEANS, 8 rooms. Every Bethel is focused on being clean, but this one is especially interested in cleanliness. She will probably write more about her assignment later. We remain quite busy till quitting time at 5 PM. Even though we don’t get to work together, we get to eat lunch together and visit a bit after. The construction crew has a separate lunch and dinner area. It’s nice arrangement as at other projects you have to clean up and change cloths to eat lunch with the Bethel Family. Here is a picture of us at lunch. My assignment is in the construction field. I originally came to do plastering but there is a larger need for concrete forming and steel stud framing. Since I have never really done much of either of these, I am in a steep learning curve. 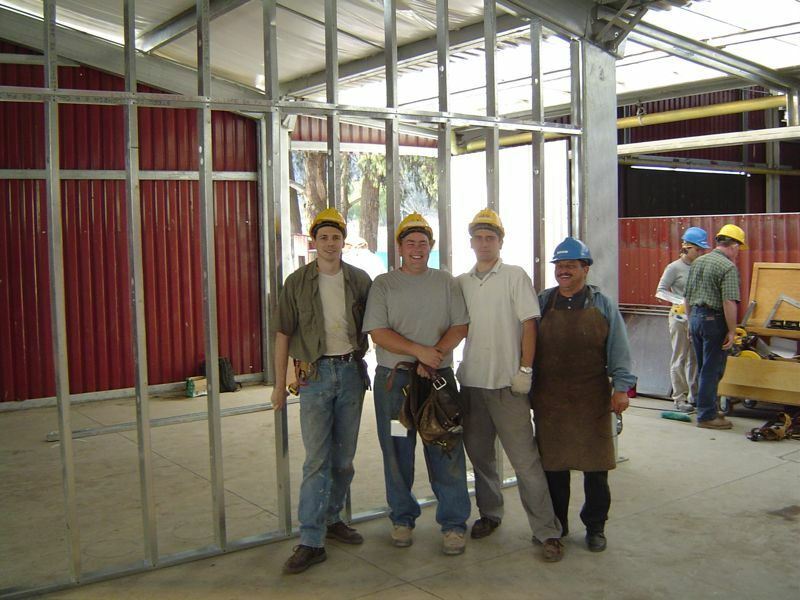 Steel stud framing is just like framing a house but instead of wood you use steel 2 X 4’s. At the moment we are building temporary housing for Brothers that are coming in to help with the construction project. There will be a big push at the end of January and there are not enough rooms to house all those coming to help. Here is a few pictures. This is the temporary housing we are building. 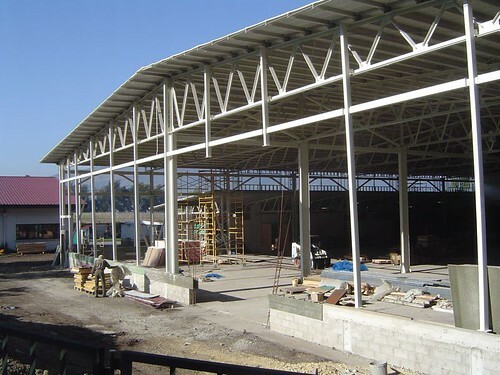 Here is another picture of the factory that we will be working on after this housing project is over. This will allow for the enlargement of the printing facilities. This Branch prints quite a bit for this country and a few of the other countries in South America. 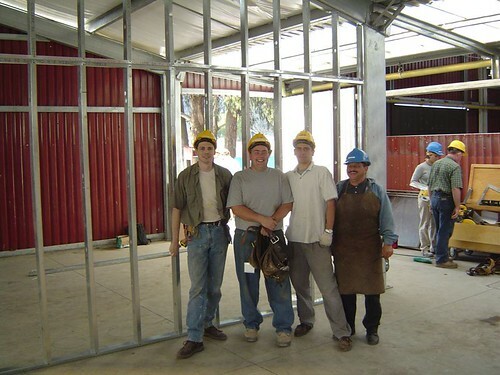 Our framing crew is small with only 6 people, some from Canada or Colombia. One of the best parts of working at a quick-build of Kingdom Halls or working at a Bethel is that you get to share and hear the faith strengthen stories of the lives of those you work with. This assignment is no exception. It is probably my favorite part of being here. Of course, we as all Jehovah’s Witnesses go to 3 meetings a week in our local congregation, where ever that is. The only difference here is that it is in Spanish. Tamara is picking up the language fairly quickly but for me, it is a bit harder. Most of the time I am lost but there are a few golden moments where I can keep up. We try to answer as best as we can, usually I just answer in English. Most of the Brothers and Sisters don’t speak much more English than I speak Spanish, yet we are warmly taken care of. The Brothers here are very warm and have all the needed things of life. In fact we went into town over the week end and were surprised at how similar Colombia is like Home. Things are of course different but not really that much. Here is a picture of us during our shopping trip, we were trying to track down a measuring cup and some shoes for Tamara. One thing that the Colombians take seriously is Holidays. Witnesses don’t celebrate New Years Day, but the Army training grounds (next to the Bethel) and the Police training grounds (on the other side) sure do! In fact, they try to out do each other every year with louder and bigger fireworks. I will just let your imagination run wild at the explosives the Army and Police have access to make fireworks. I am not sure who won but there seemed to be many contenders around the city. The locals call it the war between the Army and Police. One last thing before we sign off, I wanted to show you some of the interesting foods we have get here in South America. 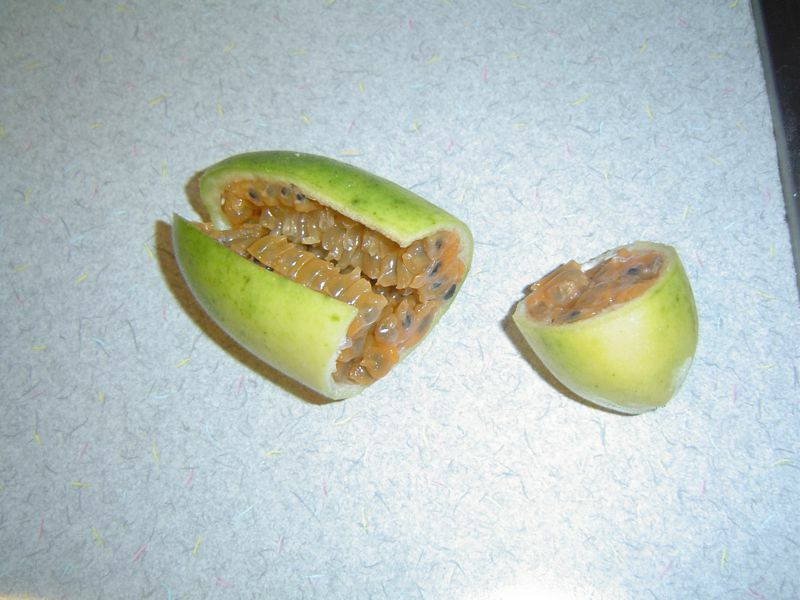 Two of the fruits are Passion Fruit and Curuba. They were both very good, except for the Passion fruit. 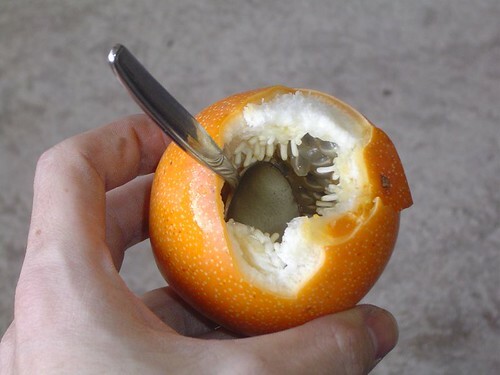 Although looking just like a orange, the hard shell is cracked open and with a spoon you eat what looks like monkey brains (from Indiana Jones Movies). If you can get past the texture it tastes great. Have an above average day! 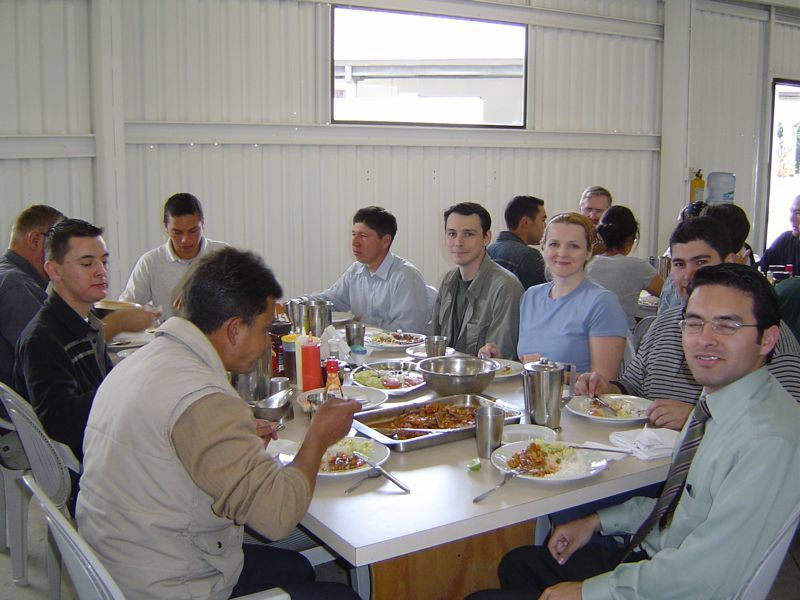 This entry was posted on October 9, 2008, 1:37 pm and is filed under Bethel, Colombia Assignment. You can follow any responses to this entry through RSS 2.0. You can leave a response, or trackback from your own site. 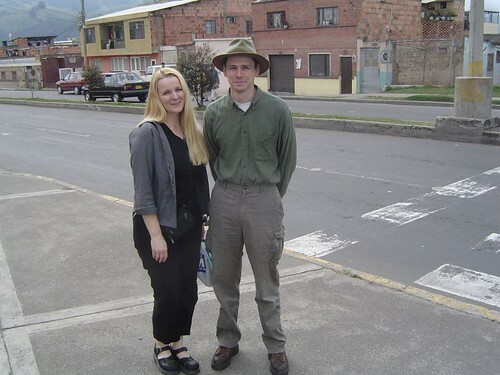 Thanks for sharing your Awesome experience in Colombia ! Yah Bless .